Dhaka, 26 September, Abnews: President M Abdul Hamid, who is now on a five-day tour in different upazilas of his home district, today visited two schools and inaugurated Itna Upazila Multijouddha Command office here. 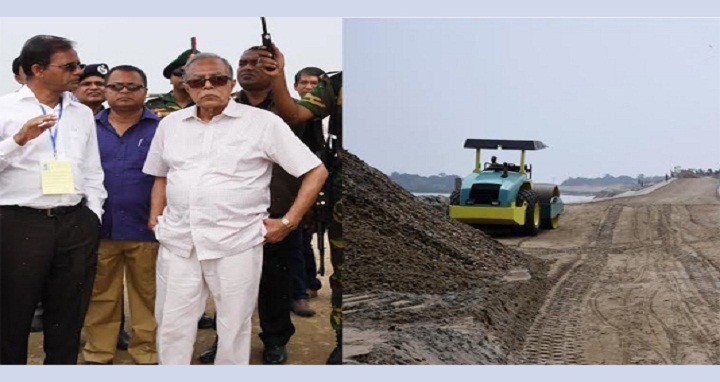 The President also witnessed the progress of development works of Itna Zero point and Chilni parts on the under-construction Itna-Mithamain- Austagram highway, which connects three upazilas of Kishoreganj – Austagram, Itna and Mithamain. While inaugurating Itna Upazila Muktijouddha Command office, he talked to freedom fighters. Abdul Hamid was one of the organisers of the 1971 Libration War and close associates of Father of the Nation Bangabandhu Sheikh Mujibur Rahman. The President visited two educational institutions – Itna Upazila Parishad Bidyapit and Itna Girls’ High School – at the upazila town. On his arrival, he was welcomed by representatives of the respective institutions, local civil and police administrations, teachers and students. He exchanged views with them and enquired about their wellbeing. Local lawmaker Engineer Rejwan Ahammad Taufiq, Kishoreganj Zila Parishad Chairman Advocate Md Zillur Rahman, Itna upazila Chairman Chowdhury Quamrul Hasan and secretaries concerned, among others, accompanied the President. Abdul Hamid arrived here on September 24 on a five-day visit. This is the second visit of Abdul Hamid to his village home in the remote area of Kishoreganj after he took oath of office as the country’s President for the second consecutive term on April 24 this year.